For this month’s style fix, my inspiration to write and elaborate on the colour ‘blue’ comes as I ponder the colour of my own bedroom. Blue is everywhere right now. 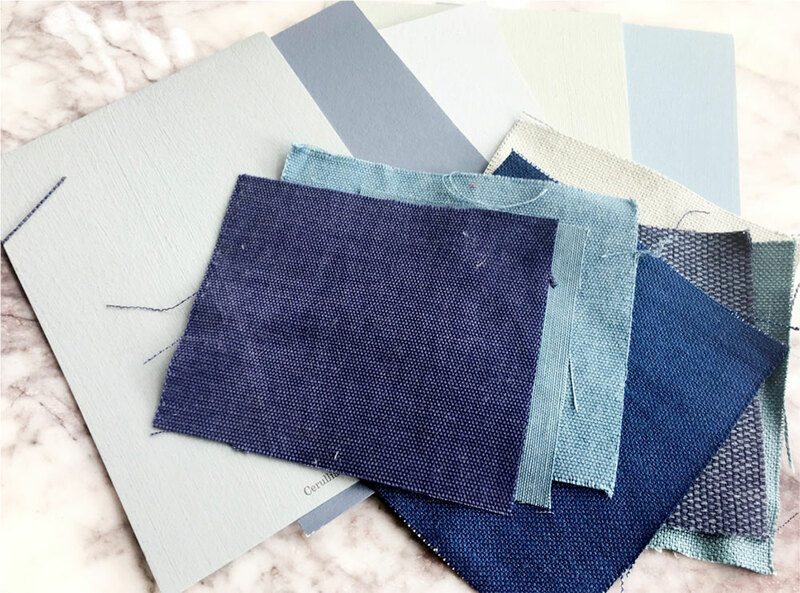 Perhaps because it was Pantone’s colour of the year 2016 which means it’s still very much at the forefront with designers this year, but perhaps moreover it’s simply stunning in all its versatile shades – from an ethereal blue to a deep navy blue lacquer…and everything in between. My ideas for decorating with blue (below) show this colour working as both a statement, mono colour space and as a minimal accent. 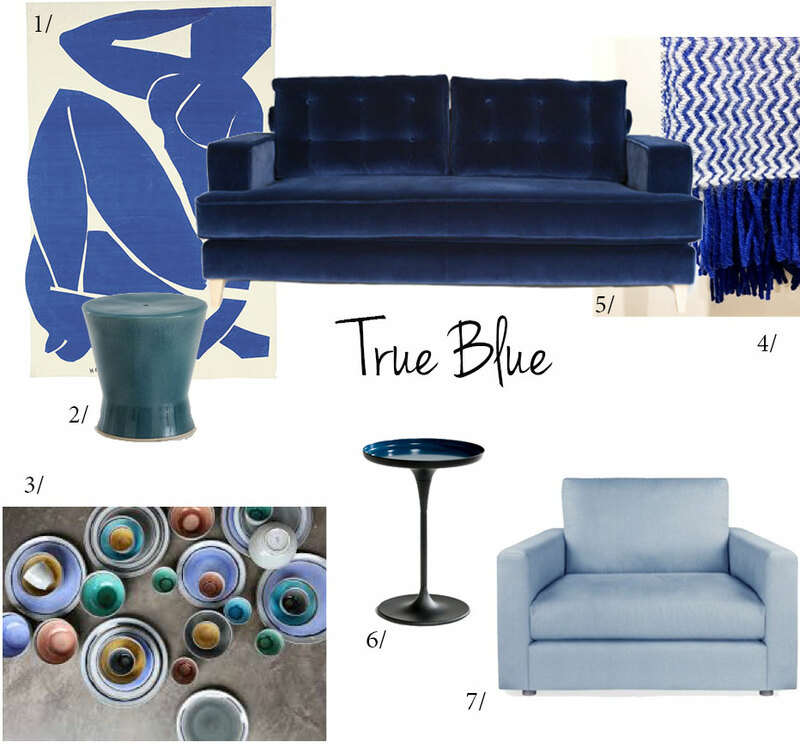 With both, blue brings a whole lot of perspective to a room. It positions so high as a most wanted colour that you can’t go wrong. However, avoid over using it on its own and combine it with another colour to create something more imaginative. Too much and psychologically, it’s a chilling colour… warm it up. Gold, for example, is stunning with it. 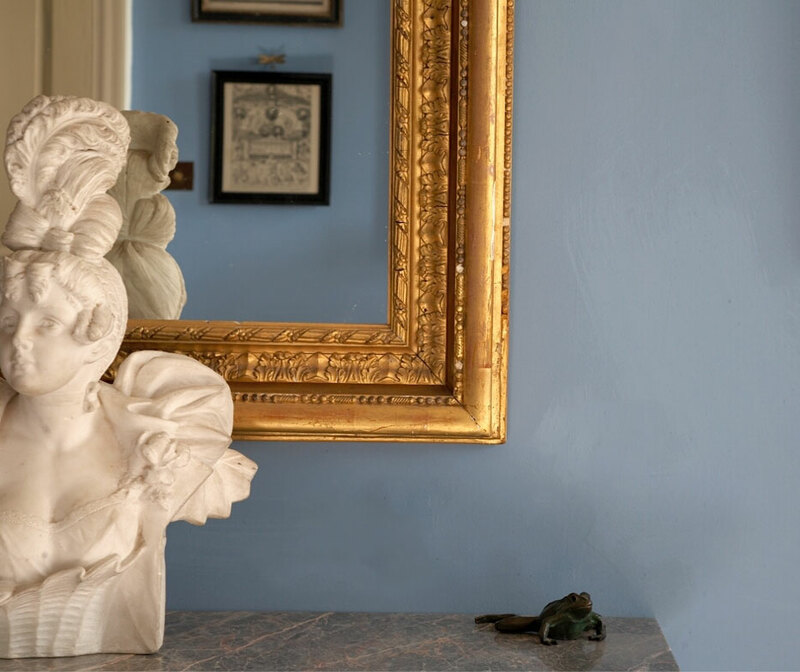 When deciding your colour schemes, consider the fundamental history behind blue. It is generally a colour used for areas where you want to cast serenity and calm in the room or an intensity. Lighter tones will be more feminine and appear more spacious while darker blues more masculine. I am drawn to Cerullian Blue by Edward Bulmer right now (top left) and as I moodboard my life away I keep coming back to it. It’s a bolder blue, but isn’t too offensive because of its lighter tone, it’s almost pastel but strong enough to make a statement and not be too overwhelming, perfect for a bedroom. Research has shown that a blue bedroom promotes more sleep than any other colour but in addition to that its proven to lower your heart rate and reduce blood pressure. If my room appears larger, I sleep better and wake up happy then I’m sold! Farrow and Ball, ‘Black Blue’ (above bottom right) is a complete contrast to the pastel shades. It’s almost black in some lights, yet blue when it picks up light. It’s bold, dramatic and makes a statement. Perfect for a front door complimented with unlaquered brass furniture. Allowing the patina to come through on the brassware compliments this inky shade of blue! 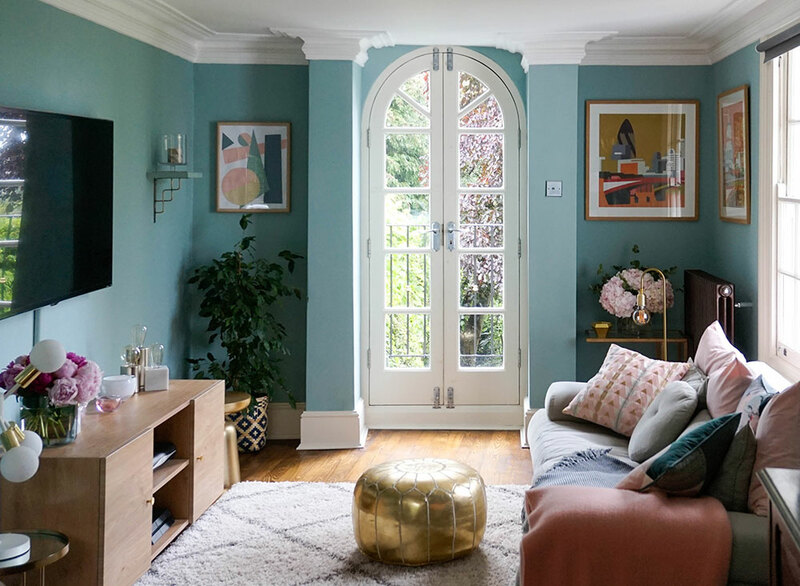 Edward Bulmer is an artisan business that creates a luxury palette of eco-friendly paints, from their HQ in Herefordshire, which not only look good but feel good. They design beautiful colours using only time honoured natural pigments from sustainable sources and use natural ingredients that protect our health, our homes and our planet. I stumbled across Edward Bulmer on social media and have become obsessed with his colours and the chalky matt finish. Here, Melissa Lissack used Farrow and Ball’s Dix blue as a backdrop to make her beautiful textures pop. 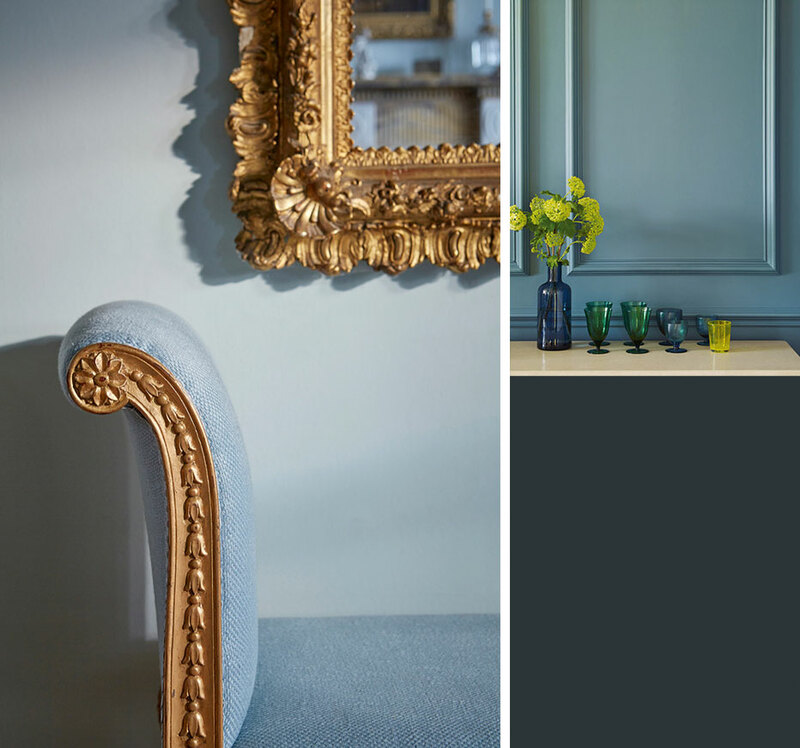 This shade is a vintage take on blue, with a large amount of green and touch of black, making it warm and an easy colour to live with. This incredible staircase (as featured in Volume 1. The Style Tales) is very unique. Eligo Studio designed this dramatic interior by using Aliva UK’s Metropolis range of paints, this staircase in particular is finished in Aliva’s Metroresin in highly polished azure blue. 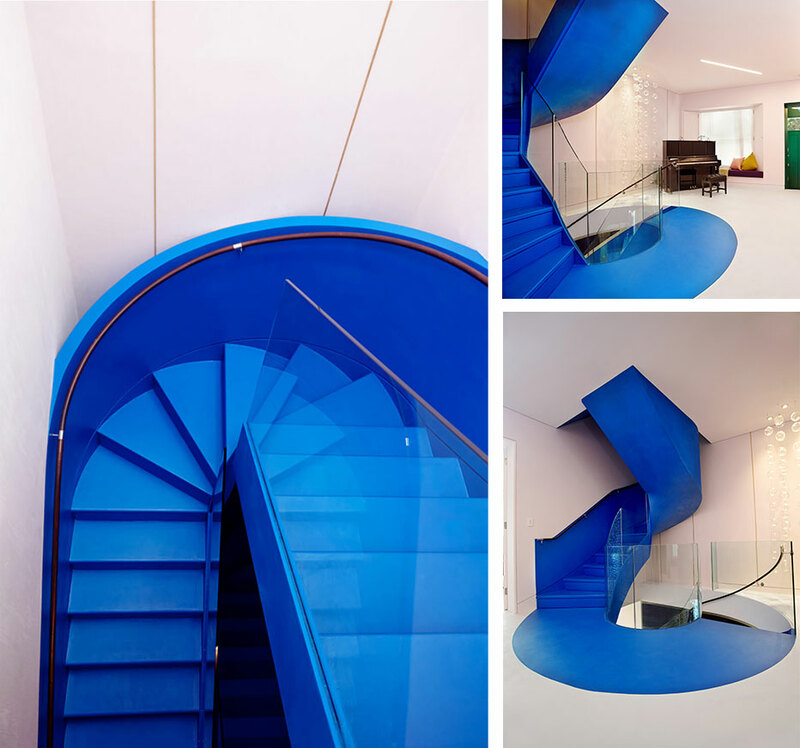 This is, of course, bespoke and not a budget we all have, so why not take some inspiration from this image and bring this design concept to your home using a bold bright blue to paint your timber staircase. Highly dramatic at a fraction of the cost. 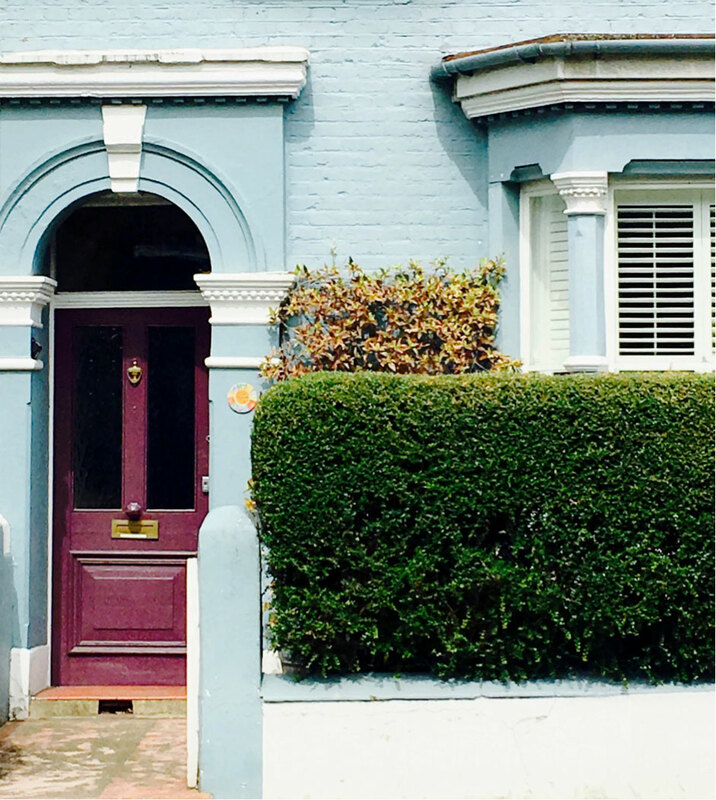 The colour of your home can trick the eye. For instance, painting your home a light colour can make it seem larger than it is and visually brings it forward to the curb. Conversely, dark colours can make a home look smaller but more substantial. I snapped these two houses whilst taking a walk looking for some inspiration for my home. Taking the leap to paint their houses blue must have been a huge decision. 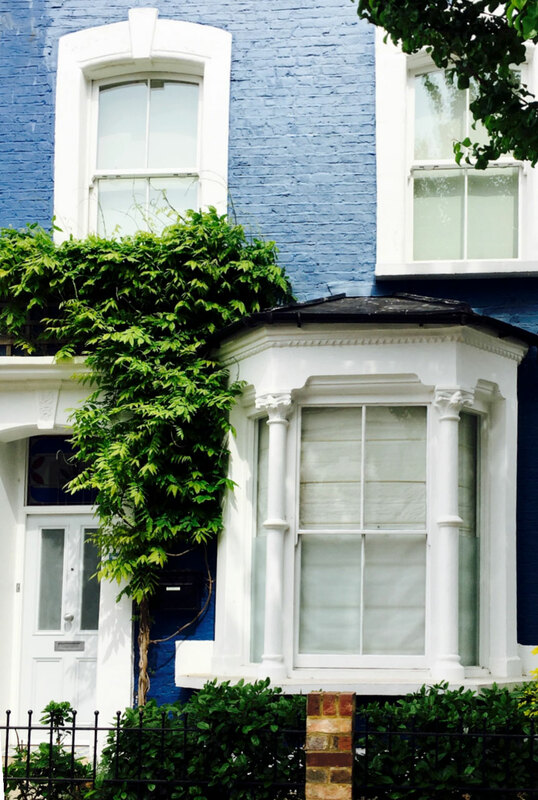 They have gone beyond painting the door blue and, instead, immersed their exteriors in fabulous shades of blue only to bring them right up to the curb and demand attention. In a not-too-shabby kind of street, they stood out a mile – in a good way. If you want to make a statement this is a sure fire way to do so!! If painting your house may make you irk, start with a few basics and introduce blue in furnishings, accessories and tableware. The key to making the room look finished is to organise your accessories with like colours. In this instance pick a main piece and work around it using the same colour palette in different tones. 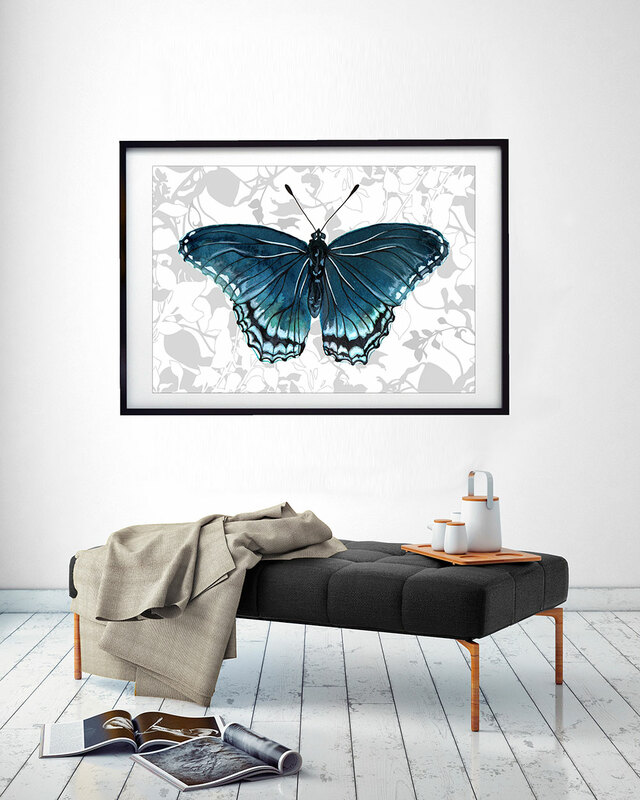 A piece of art (above image: by Terrarium Designs, as featured in Volume 2. The Colour Explosion) defines the room. Alternatively a rug pulls the room together. Look at it as the foundation of the room. In your bedroom add texture with stripes in cushions or a headboard and crisp white linen for your bed (for that hotel –like perfection). Introduce soft grey for a sophisticated contrast. It works perfectly with some shades of blue. The choice is endless so have fun with it. Credits: Written and curated by an interior stylist Ruth Daniels from Milla Decor, please follow Ruth on Instagram @milla_decor.